Having visited with our family the last 2 consecutive years this Disney resort has thought of everything to satisfy the entire family. From little ones, Mum and Dad and the Grandparents we all left hungry for more. 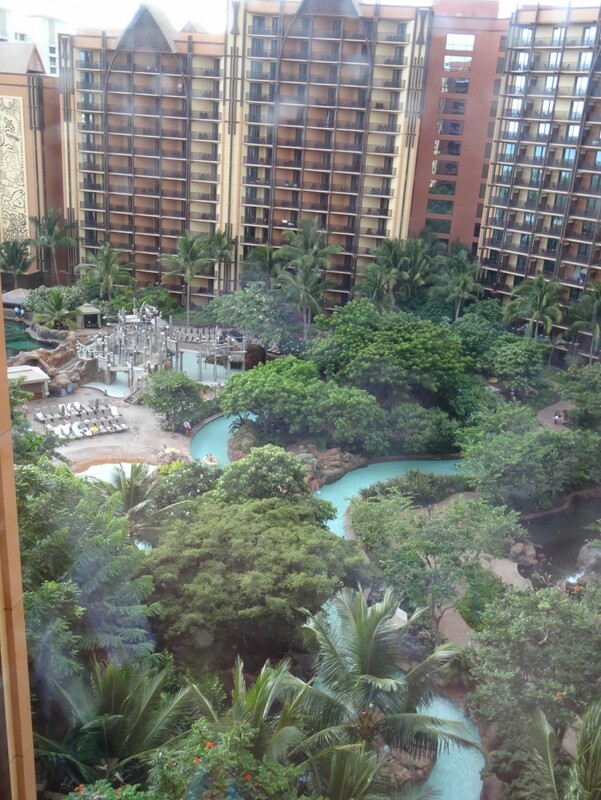 Aulani Disney is located In Ko Olina Oahu, only 30 minutes from Waikiki. 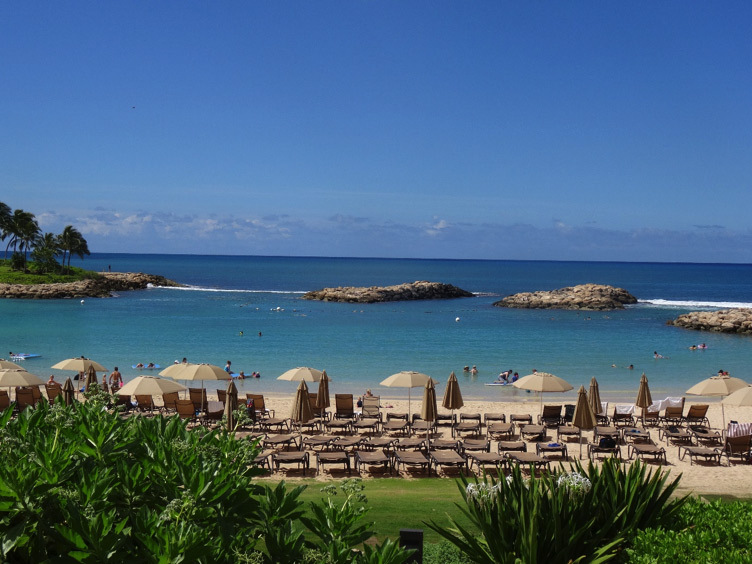 Set on 21 acres on the gorgeous beach of Ko Olina this is a tranquil oasis removed from the crowds of Waikiki. 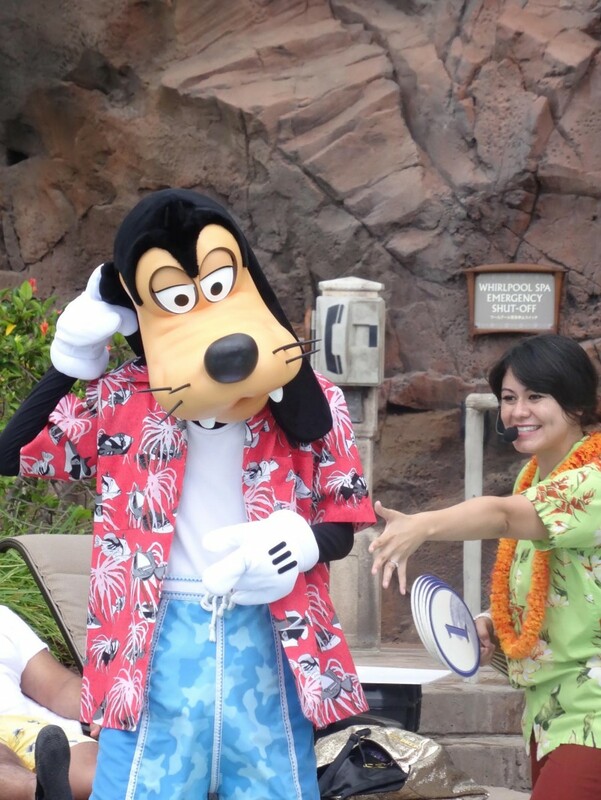 Disney celebrates Hawaiian history with a splash of Disney Magic. 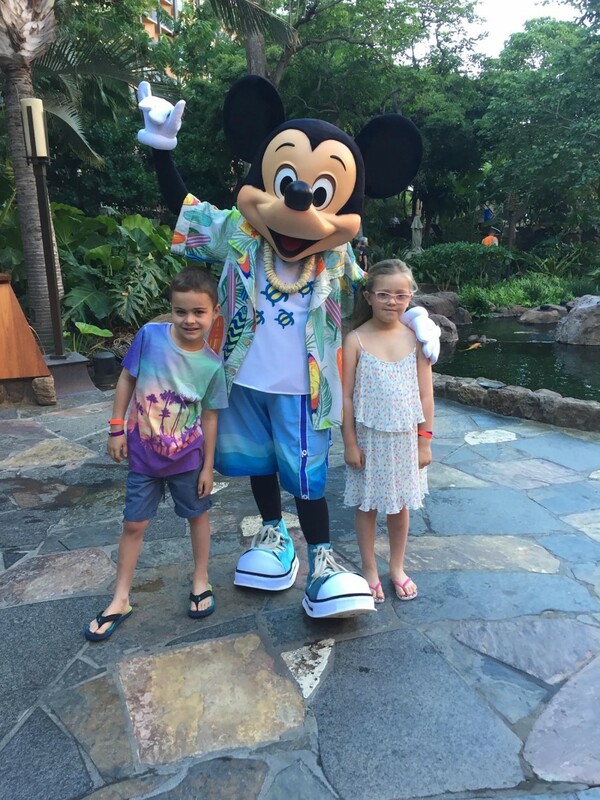 Aulani is the epitome of a wonderous family holiday. The resort has been carefully designed by Walt Disney Imagineers working closely with local artisans and cultural experts. 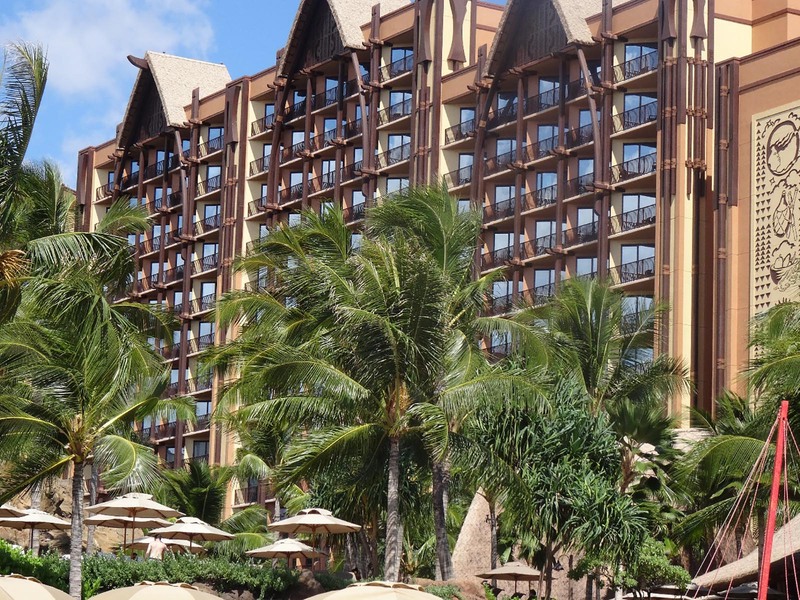 Aulani is an expansive resort, with 351 hotel rooms, including 16 suites, 481 Disney vacation club units including 19 grand villas. We stayed in a two bedroom unit, that comfortably accommodated 4 adults and two children. We love to feel home away from home when we travel. Having a full kitchen, 2 and half bathrooms, washing machine and dryer this made for an even more comfortable stay for every family member. There is a place to swim that will suit every member of the family and all the pools are heated for year round enjoyment. 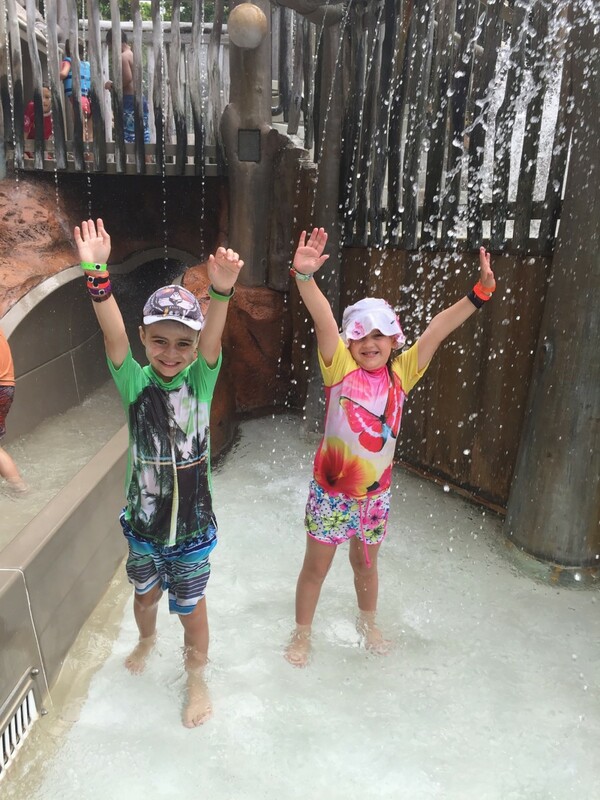 The MENEHUNE BRIDGE – offers plenty of magical water features including 2 waters slides, interactive water elements, climbing play structure this will keep the little ones entertained for hours. Both of our children were very happy spending each afternoon here. Or perhaps something a little more mellow, relaxing on a tube down the lazy river. 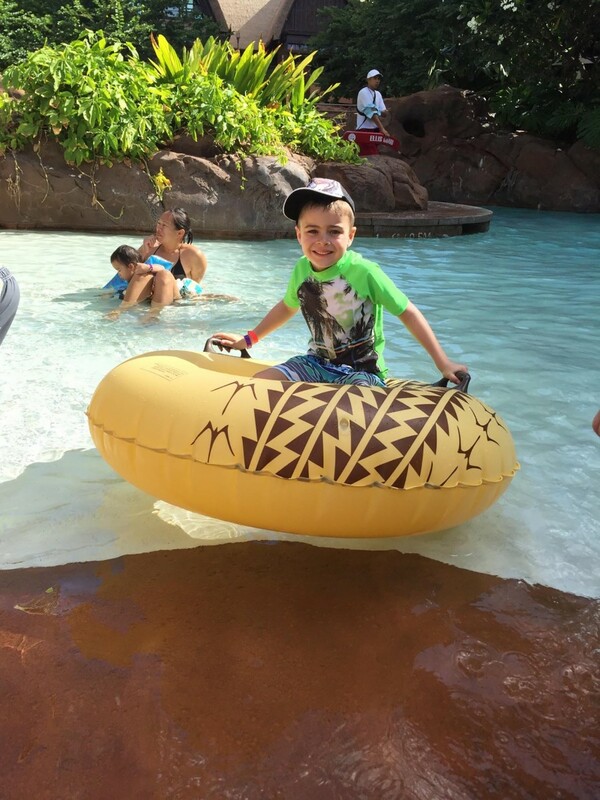 We all enjoyed spending time in the lazy river. Even the grandparents Nanny and Mimi enjoyed this relaxing ride. And for the more adventurous in the family, enjoy getting up close with tropical fish at RAINBOW REEF this is the only private snorkelling lagoon on O’ahu. This saltwater lagoon is home to thousands fish and colourful marine life. My daughter Summer and I could not get enough of snorkelling in the lagoon, truly a magical piece of paradise. 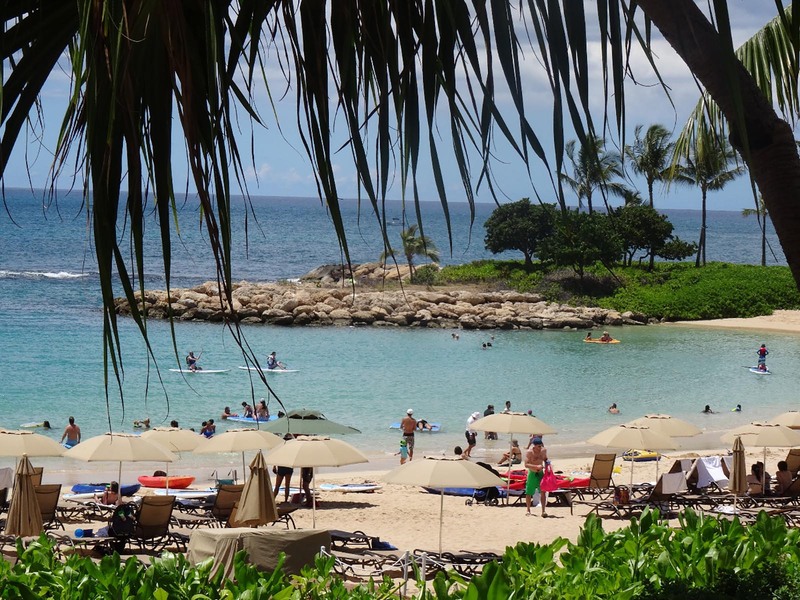 If you enjoy the sand between your toes, and making sandcastles, spending time on the beach at Ko Olina Lagoon is magical, especially sunset. This lagoon is so serene, we often spent the afternoons at the beach and swam and played on the beach enjoying the sunset. 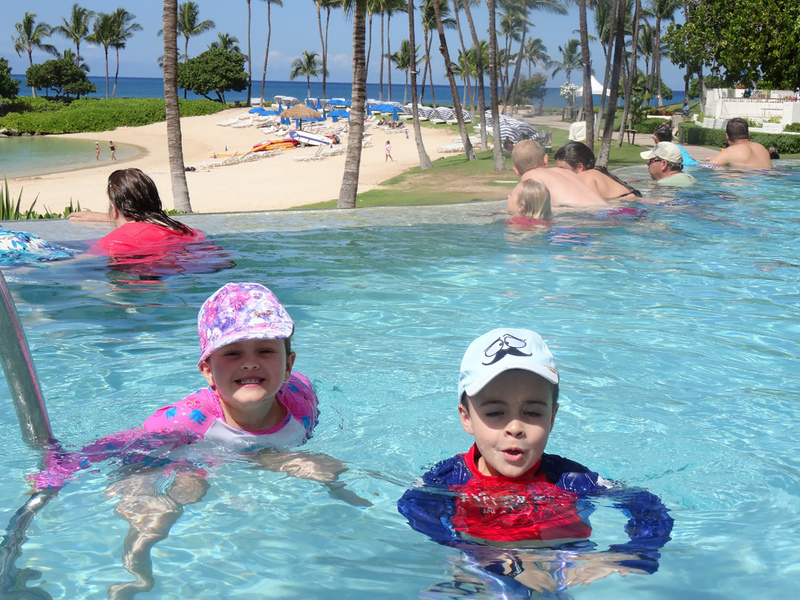 Our kids absolutely loved the Shake-A-Shaka pool parties at the Waikolohe pool. These were so much fun, dancing with the Disney characters while the music pumping and playing cool pool games. Mimi and Nanny enjoyed the entertainment whilst laid back on the comfy pool deck lounge chairs. 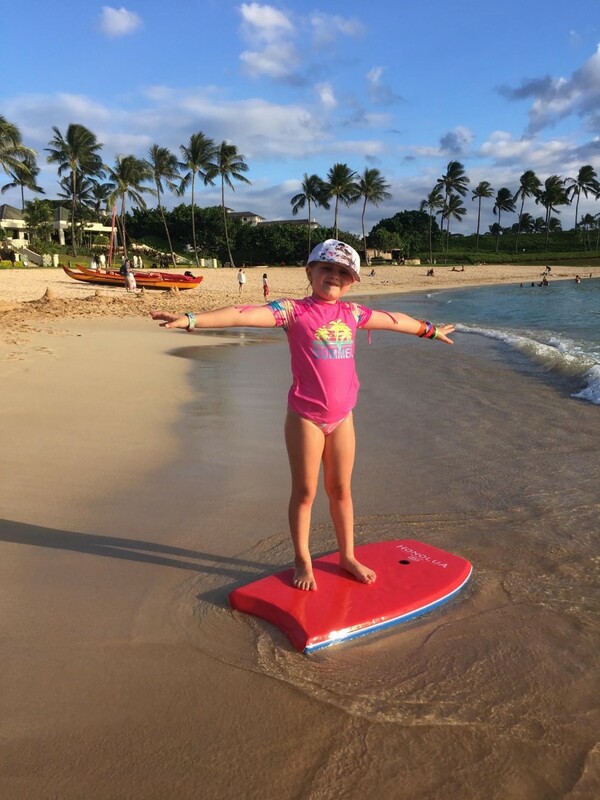 MAKIKI JOES BEACH RENTALs on Ko Olina Beach has everything to keep the family entertained whilst at the beach. 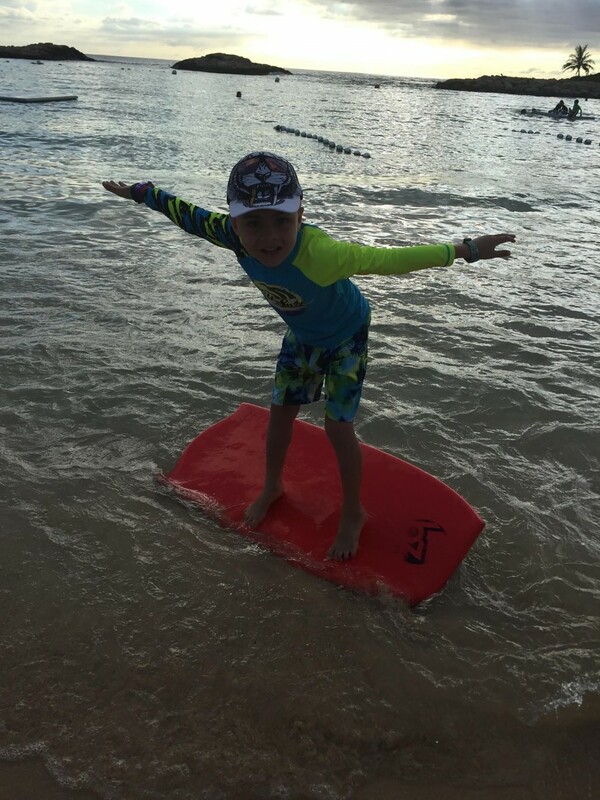 Our kids enjoyed riding the small waves on the boogie boards, we enjoyed cruising around the lagoon on the Paddle boards and Kayaks. The grandparents enjoyed relaxing in the Cabanas on the lush green lawn at the foot of the sand. 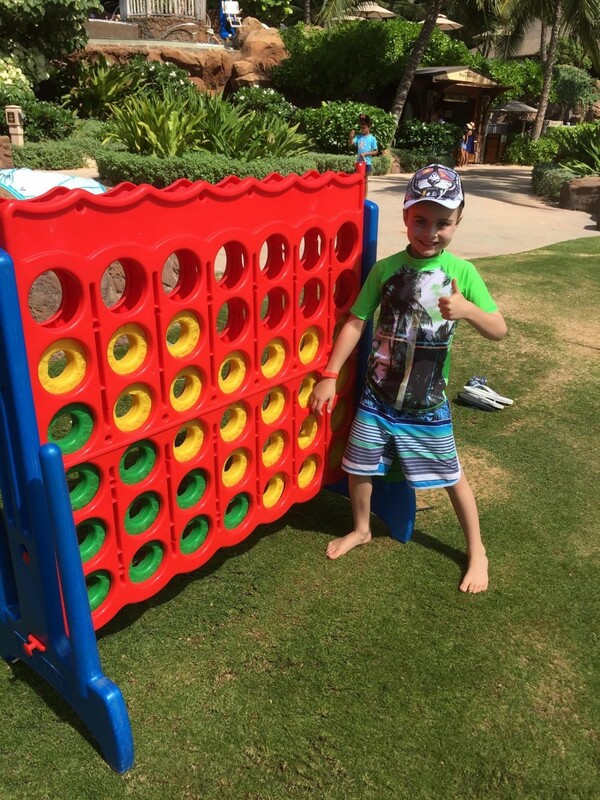 Both of the kids enjoyed playing table tennis and using the giant sized connect 4, in between running in and out of the beach. 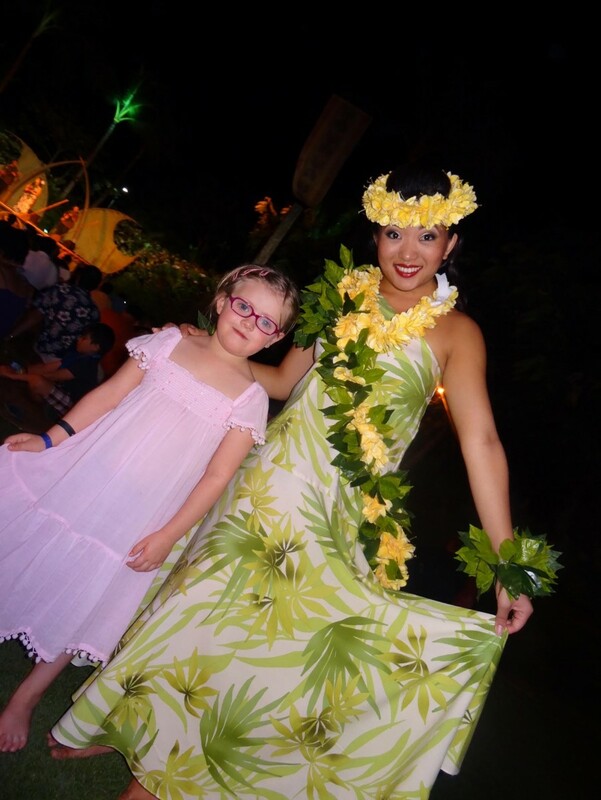 This resort captivates its guests on a magical Hawaiian cultural journey through art, cultural activities and Aunty’s Beach house kids Club. Aunty’s Beach house is every childs haven. This kids club is over 5200 square foot running from inside to the most amazing garden full of outdoor play equipment, is sure to delight any child. Aunty’s beach house caters for children ages 3-12years, all children must be registered to use the Aunty’s Beach house facilities. 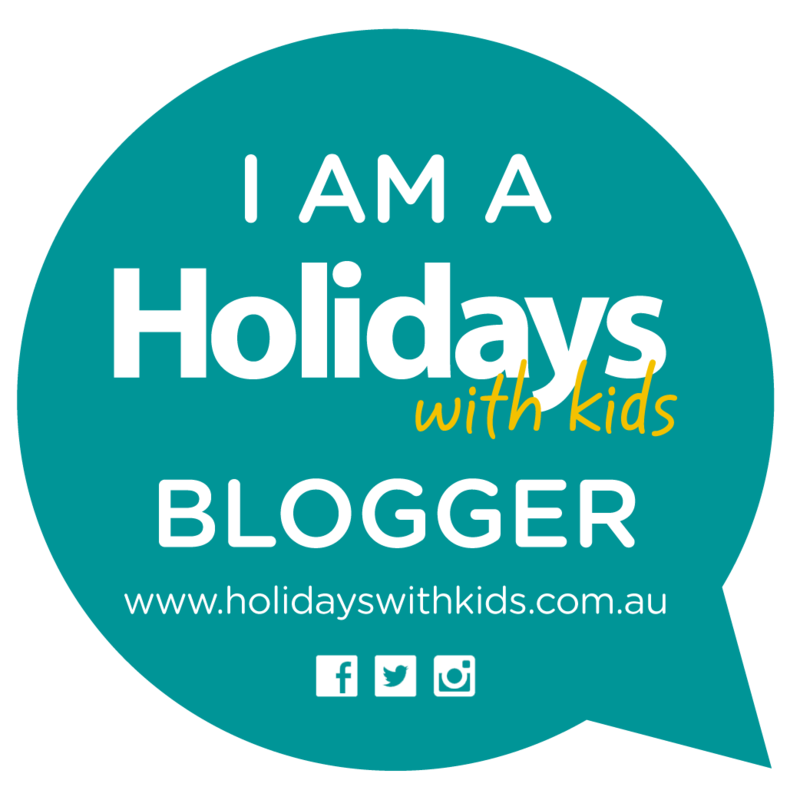 To register the children you have the option to do this whilst at the resort or complete it online prior to save some time. 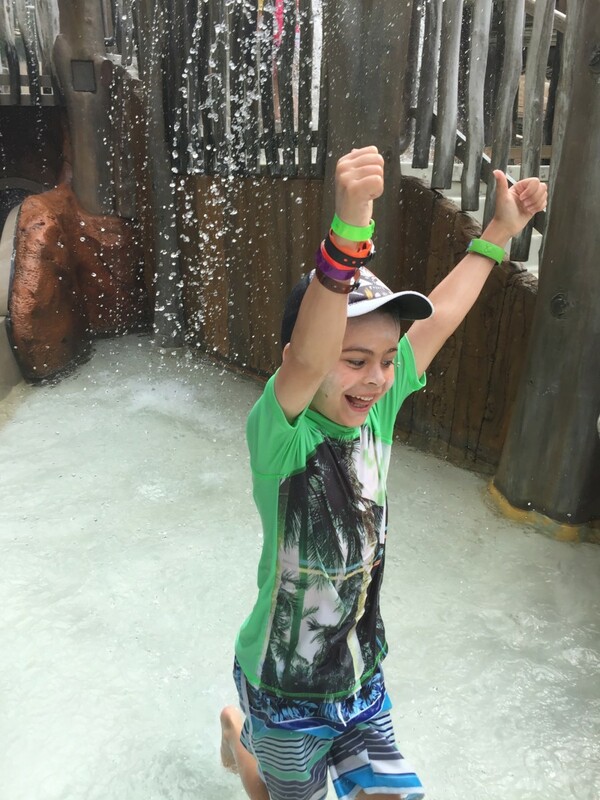 Most activities are complimentary however the premium activities are at a small fee, our children have participated in most of the premium activities and its definitely well worth paying the extra fee. We were totally blown away with the facilities and the service. 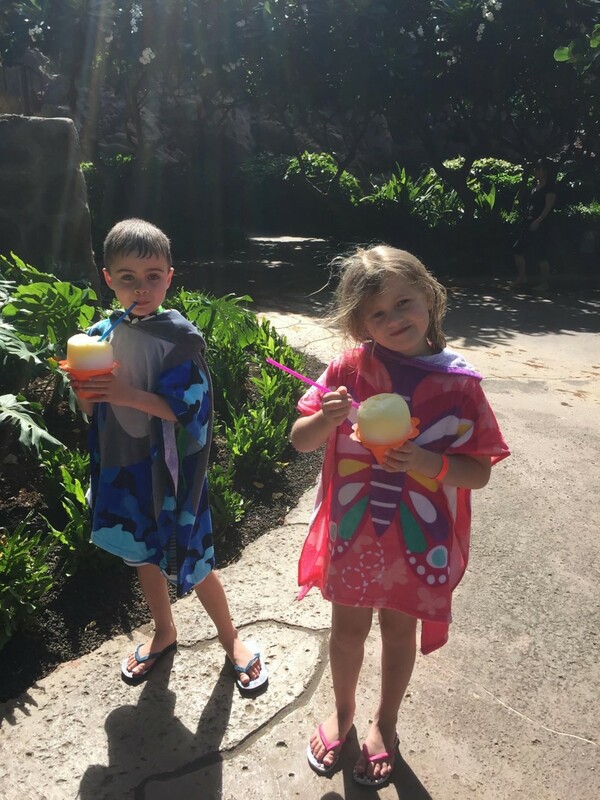 The check in process for the kids club is seamless, each child is issued their very own special keiki (child) band, which they get to keep as a souvenir at the end of the resort stay. They even supply the parent with a mobile phone so that you can be contacted easily. Our daughter Summer has several food allergies (which staff were made aware of upon registrations, and any required medications such as EpiPens were to be handed to staff each visit and placed in clearly labelled container) We had no sooner dropped our kids off for the evening activity and the Head Chef was calling to ensure the correct food would be catered for her meal. Now that is exceptional service in my books. Inside Auntys beach house is an area for Hawaiian arts and crafts, Wii and Sony playstation games, interactive games table, a costume cupboard full of fabulous dress ups. 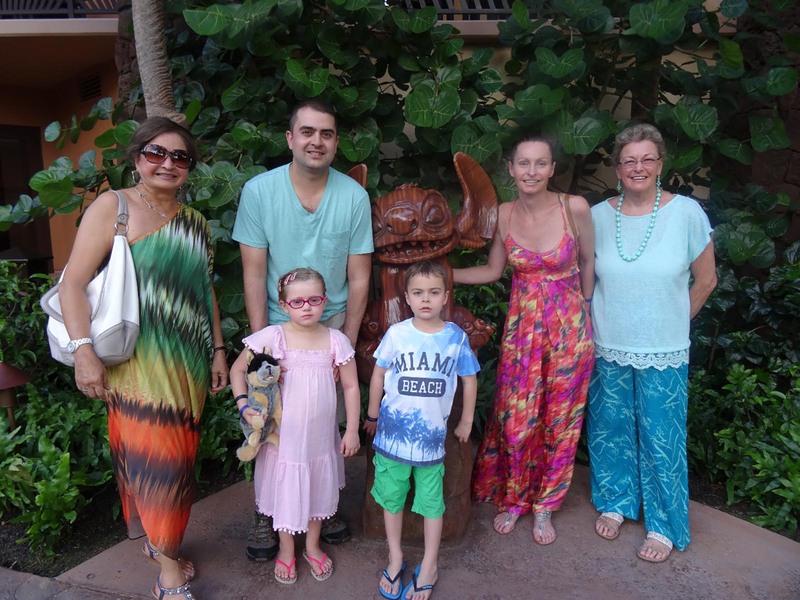 Visits from Disney friends, story telling and the most amazing premium activities. Both of our kids signed up for the Fish are Friends this is an additional fee however includes, food, souvenirs. 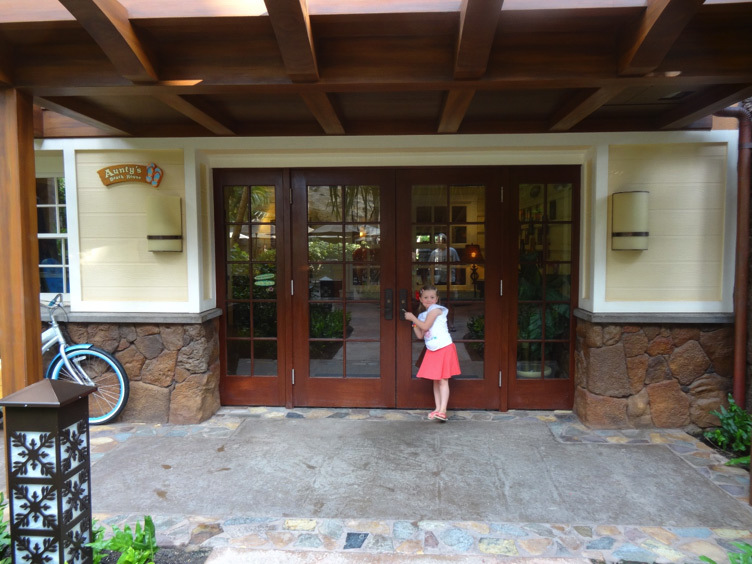 The kids learn how animal specialist train, feed and care for the animals at Aulani. They prepare fish food and feed it to the fish. Our kids loved this 3hour activity. Summer enjoyed one afternoon with Chip N Dale a surf themed party. All the kids decorated their own wooden mini-surfboard and even danced with Chip N Dale. Painted Sky Teen Spa caters for ages 13years – 17years, this stunning retreat offers spa treatments and activities for teenagers, where they can hangout and relax and meet other teens. A highlight for both Noah and Summer was the interactive scavenger hunt. We collected the special cell phone from the community centre and we were off and running. 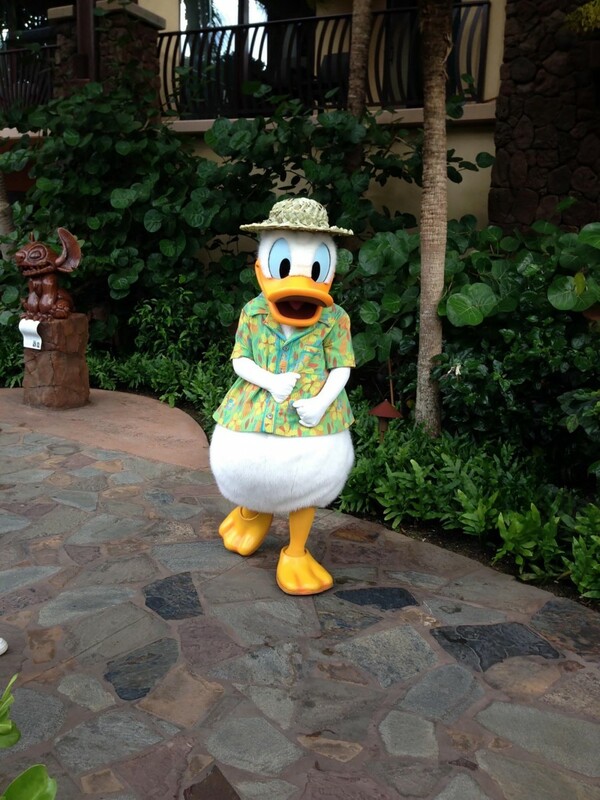 The phone plays videos and gives you special clues taking you around the resort. We were not expecting so many wonderful surprises along the way. 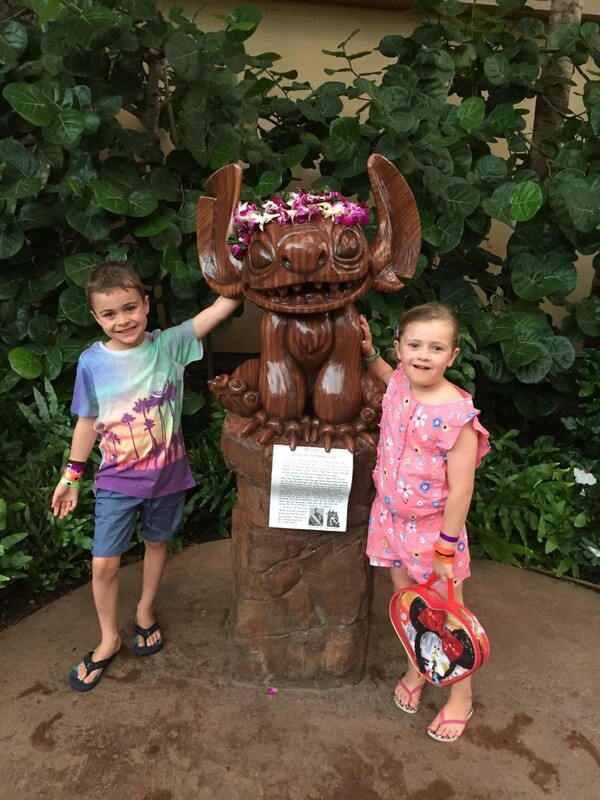 This was such a fabulous activity, as the kids were captivated the entire time whilst learning about Hawaiian culture and the cheeky little Menehune- the legendary ‘little people of Hawaii’. Of an evening there were still an assortment of activities and entertainment. Live music while enjoying an aperitif was such a beautiful way to wind down the day. The story telling told by Uncle a master story teller sitting by the open fire was magical, whilst sitting under the stars. There were Disney movie nights. The Starlit Hui sitting on the Hawaiian lawn watching hula, singing and Hawaiian crafts. There are two restaurants the AMA AMA located steps from the beach, offering modern interpretation of Hawaiian cuisine. We dined here as a family, kids, grandparents, Mum and dad. It is certainly not one of the cheapest dining options. We enjoyed our meal, however as we found the little village down the road only walking distance we had many other dining options that were more affordable. Our kids loved MONKEY POD. I lost count as to how many times we dined here for dinner. Monkey Pod has a great varied menu selection. We would then all grab an ice cream from the ice cream parlour on our way back to the resort, which is only a 5minute walk. The other dining option for dinner at the resort is offered at the Makahiki restaurant (where the Disney character breakfast is offered of a morning) we did not dine here for dinner. The Makahiki offers a full buffet style dinner of an evening. 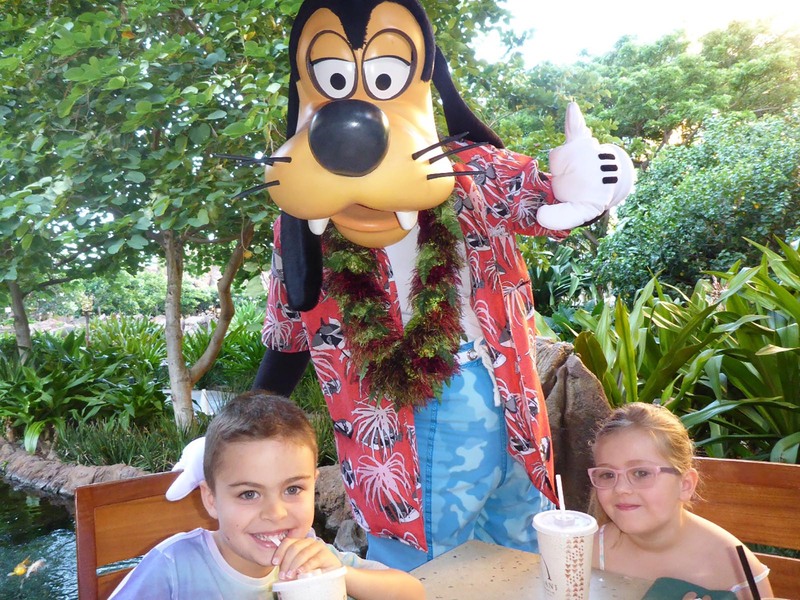 The Makahiki offers a buffet for both breakfast and dinner also where the Magical Disney Character Breakfast. We have enjoyed the Disney Character Breakfast on both vacations. 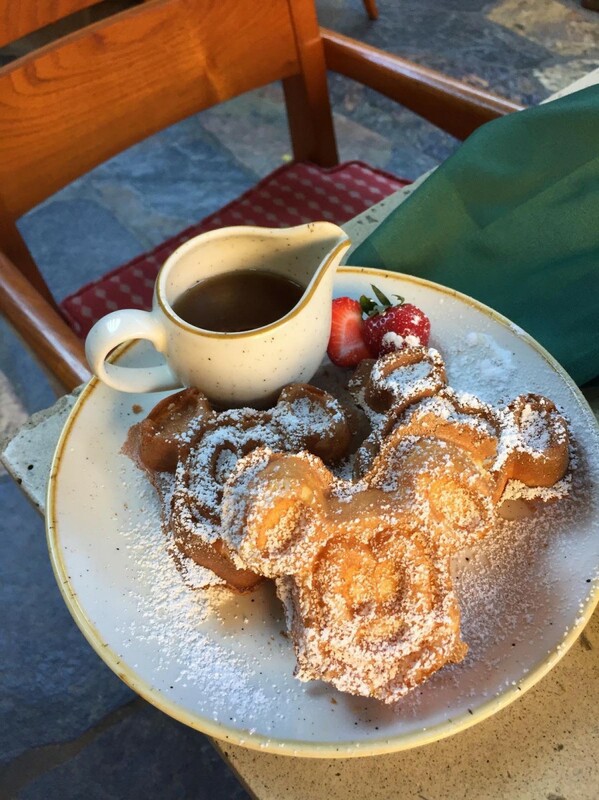 The kids enjoyed Mickey Mouse waffles, selection of hot and cold foods. 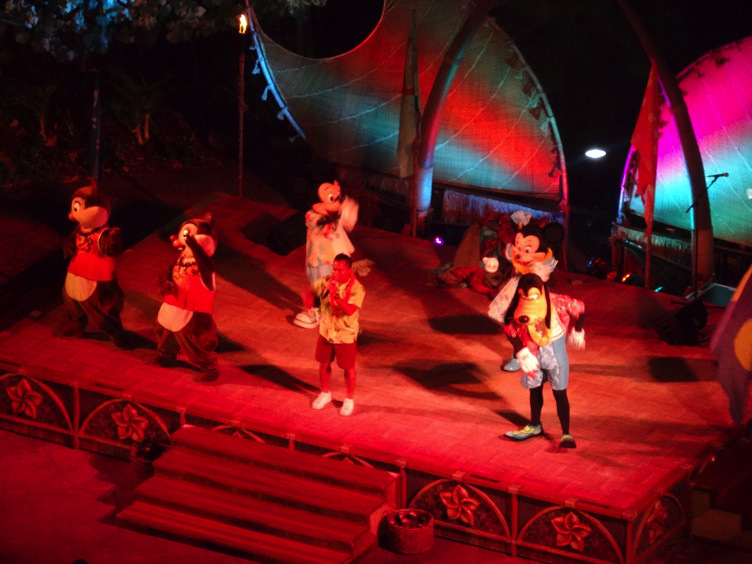 While being entertained by the Disney characters, the kids joined in dancing with the Disney Characters. Lots of super photo opportunities to be had also. All kids young and for the young at heart enjoyed the SHAVED ICE STAND this was a super treat for our kids each day. Lunch each day was spent by the pool from either Off the Hook or Ulu Café both found around the pool area. Because we were staying in a 2bedroom unit that had full kitchen facility we were able to walk to the ABC store located 5min walk at the little shopping village. This was perfect, so we always had snack on hand to satisfy hungry little tummies. Having been fortunate enough to stay at this resort two years in a row. On our first visit the resort was not at full capacity which was fantastic. The second visit however, co-insided with local holiday break, the resort was at full capacity. This certainly made a difference. On our first visit we never had issues finding chairs around the pool, did not have difficulty accessing childrens programmes at Aunty’s Beach house, or having to wait for equipment at the beach. On our second visit, due to the resort being at full capacity, we noticed at 6.30am guests were already reserving towels around the pool, we had to line up in the morning to ensure the kids would have a place in the chosen kids clubs activities and even had to wait some days to access equipment at the beach. This being said, we still had the most amazing time, but if we were planning on going again would definitely do our best to go out of holiday breaks/peak season. 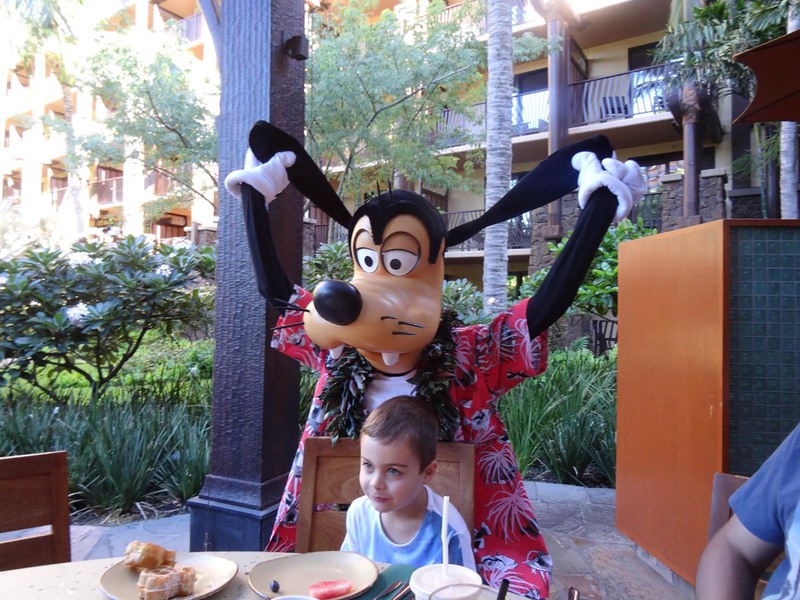 As a family we have very fond memories from both visits to Aulani. I certainly recommend to every family with little youngesters its one place to put on the TO DO list.